The Everyone’s Favorite Goalie Watch: Thanks, That Was Fun. All of us Everyone’s Favorite Goalie fans knew that this day would come. Pittsburgh Penguins star goaltender Marc-Andre Fleury would eventually recover from his “lower body” injury, and want his job back. And because of this, John Curry would get sent back down to Michael Scott’s favorite hockey team, the Wilkes-Barre Scranton Penguins. Curry didn’t leave without earning his second NHL win, stopping 24 of 26 shots in a 9-2 Penguins win against the Islanders. Pittsburgh-ians like him. For example, according to my Twitter friend @erinkpgh, a “Spicy Curry” sign seen in the crowd at the Mellon Arena. Several game accounts mentioned a few really spectacular saves that he made, and while he got lost in the shuffle after two of his teammates scored hat tricks, many in the Penguins blogosphere have expressed their hope to see him back permanently next year, after Sabourin leaves in free agency. Pittsburgh, all BU fans would like to thank you for taking such good care of our beloved Curry. We are happy knowing he is in good hands, that he’s appreciated, and that you’ve caught on to making amusing signs using his last name. And BU fans, here’s a fun fact to taunt your favorite Boston College Eagles fan with: Curry leaves the NHL with more wins than Cory Schneider. Take that. According to the Pittsburgh Post Gazette’s Empty Netters blog, John Curry will get the start for the Pittsburgh Penguins tonight against the New York Islanders at Nassau Coliseum. Isn’t this a case of deja vu? Curry’s first NHL start and win happened on November 24th against the Islanders at Nassau Coliseum. It is hard to gather from the blogosphere if this start is more because of the two games in two nights schedule, or more because Dany Sabourin has been in net for three straight losses. While many (like The Pensblog and others) mention that while Sabourin hasn’t been awful, he hasn’t been awesome, and that him sitting a game might not be the worst idea. The general sense I’ve gotten from all that I’ve read is that the Penguins defense hasn’t been making plays when they need to, and that has been what has hurt them most, not necessarily goaltending. You know you’ve made it when you have a RotoWatch update. Joe at Let’s Go Terriers (a frequent commenter of mine) has a great piece on Curry’s game. Meanwhile, we were sitting the press box tonight, watching this clunker, thinking how it would be so much more interesting to write the John Curry story tonight on the Island. He came in with Pittsburgh down 3-0, making his first regular-season NHL appearance, stopped all 11 shots he faced and watched as Evgeni Malkin scored three times (and perhaps more remarkably, Brooks Orpik had a goal and an assist) to give the parent Pens a 5-3 win. That’s it for tonight. A sports girl’s got to sleep (and write the six articles she’s behind for the Examiner, and the one she’s behind for the HLOG.) Happy Thanksgiving, all! The Pittsburgh Tribune Review game review has now been posted: Penguins complete another comeback. Serendipitously, they had published an article today on Curry, Curry’s battle brings him to NHL. Needless to say, I have had more excited texts in the past few hours than any other two hour timespan since I’ve had a cell phone. BU fans really adored Curry during his time in Boston, and are genuinely excited that he’s made it to “the big time.” He’s the first player from the past few classes to make it to the NHL, so he’s the first a lot of current students remember watching in college. Curry gets the win! 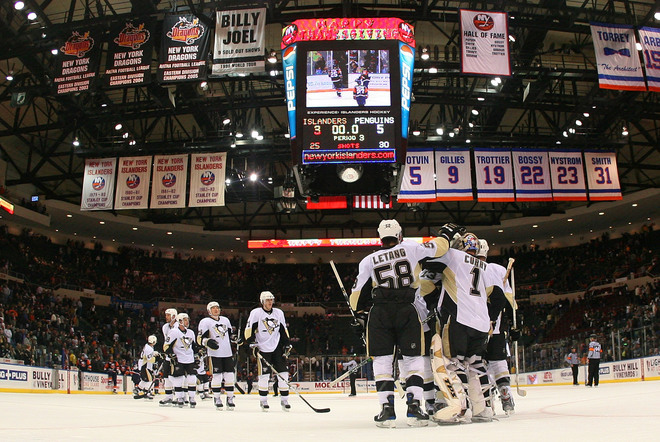 He made 11 saves, and the Penguins came storming back to beat the Islanders 5-3. I’ve spent the last 45 minutes texting and messaging with tons of Terrier fans about the game. I’ll start the linkage now with the official game summary from the Penguins. Here’s the ESPN game summary – short now, but bound to be longer soon. In fun trivia notes, the Islanders goaltender tonight was Joey McDonald, the same goaltender Curry faced off against in his infamous goalie fight from last February. In tonight’s New York Islanders – Pittsburgh Penguins game, Dany “It’s Finalized, No One Can Say His Name” Sabourin was benched after letting up three goals. Everyone’s Favorite Goalie, John Curry, has been inserted in his place. As of this writing, he has played 10:33 and has stopped five shots as the Pens are still behind 3-1. We are enjoying a quiet night of watching hockey (the Boston Bruins – Buffalo Sabres game in particular), so we will be sure to update before the evening ends with how he did. This song perfectly represents the past two weeks in Boston University hockey. I now understand why the fiance and I heard it four times while running errands before Saturday evening’s hockey game against the University of Vermont. It is so the unofficial theme song for this team, who has lost three of their last four games after starting out the darling of the college hockey scene. 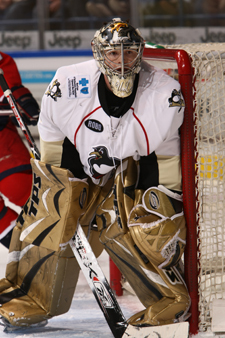 In this edition of “The Everyone’s Favorite Goalie” watch (insert overly dramatic TV news graphic here), news out of Wilkes-Barre this morning is that John Curry is on his way to Pittsburgh, where he will back up Dany “Still Can’t Find Anyone Who Can Pronounce His Last Name” Sabourin. This is the first regular season call-up for Everyone’s Favorite Goalie. He spent the pre-season with Pittsburgh, and technically was on the roster when they played their first two regular season games in Europe, but did not dress.